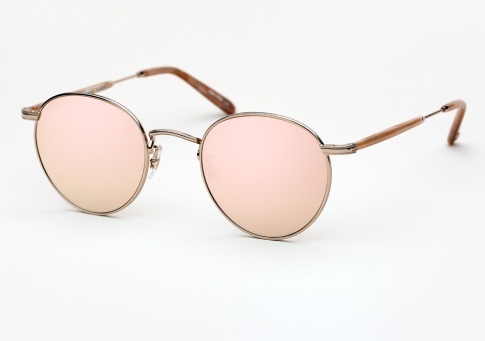 Garrett Leight Wilson M - Sandstone w/ Pink Gold Mirror Need Help? The Wilson M is a minimalist, yet highly refined and sophisticated sunglass. It features laser etched filigree detailing along the eye wire and end pieces, Japanese layered mirror lenses, and silicone nose pads for comfort and a finely tailored fit. It is offered here in gold metal and "Sandstone" acetate, paired with semi-flat pink gold mirrored lenses. Anti-Reflective Coating: on the inside of lens eliminates distracting bounce back glare. Nose pads: provide comfort and a finely tailored fit.